Source: I received an Advance Readers’ Copy of this book from the publisher in exchange for my honest opinion. This in no way affected my review. Can I give this book ALL THE STARS? I loved Jenn Bennett’s 2017 novel, ALEX APPROXIMATELY, but after STARRY EYES she has officially cemented her place in my list of favorite authors. This is a unique take on the ‘survival story’ trope. After being straight up abandoned in the mountains by their (terrible) friends, they have to spend the next several days together hiking through the wilderness to get back to civilization. This is further complicated by the fact that Zorie is still hurt that Lennon ditched her for seemingly no reason when they were starting to get together the year before. Lennon, however, happens to be an expert camper and hiker, and comes up with a plan to get them to where they need to be. Lennon and Zorie were honestly not my favorite characters at the beginning of the book, but they really grew on me! And not just in a “you’re not so bad, after all” kind of way. They grew on me in a “I LOVE YOU AND I LOVE YOU TOGETHER. NOW KISS!” kind of way. I love when a book’s setting is so real and perfect that it makes you want to go there. The Northern California Sierra Nevadas are described beautifully throughout the book. As I was reading, I could practically smell that mountain air and hear the pinecones crunching underfoot. There are also a few sub-plots surrounding Lennon and Zorie’s families. Jenn Bennett has SUCH a way of melding several fantastic plot lines and expertly tying them together by the end. I don’t want to say too much because I think it is best to read it without expectations. The family drama was really well-done and added a fantastic layer to the story that will leave you rooting for Lennon and Zorie even more. This book also has quite a bit of diversity, which is always a plus! I want to read this book over and over again. I want to jump into it and tag along on Zorie’s adventure through the mountains…but maybe at a distance. I certainly wouldn’t want to be the one getting in the way of the romance! 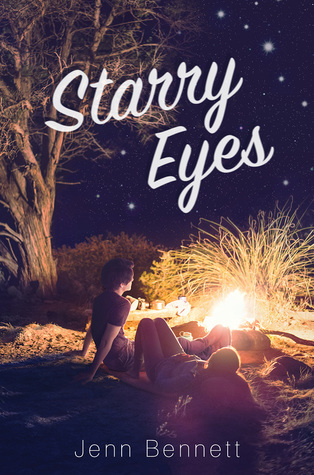 STARRY EYES was easily my most anticipated book of 2018, and I’m so pleased to say that it was everything I wanted and more. I highly recommend this to anyone who enjoys romance with some added depth. It certainly left me starry eyed. STARRY EYES is out today! Please support Jenn Bennett by purchasing a copy at your local book store.